This dense, creamy OREO Peanut Butter Cheesecake takes only 20 minutes to make, but your family will be talking about it for weeks. Crush 16 cookies to form fine crumbs; coarsely chop remaining cookies. Mix crushed cookies and butter; press onto bottom of 9-inch springform pan. Beat cream cheese and sugar in large bowl with mixer until blended. Add sour cream and peanut butter; mix well. Add eggs, 1 at a time, mixing on low speed after each just until blended. Gently stir in chopped cookies. Pour over crust. Bake 50 min. to 1 hour or until center is almost set. Run knife around rim of pan to loosen cake; cool before removing rim. Refrigerate 4 hours. Prepare using PHILADELPHIA Neufchatel Cheese and BREAKSTONE'S Reduced Fat or KNUDSEN Light Sour Cream. When cutting creamy-textured desserts, such as cheesecakes, carefully wipe off the knife blade between cuts with a damp clean towel. This prevents the creamy filling from building up on the blade, ensuring nice clean cuts that leave the filling intact. Check a cheesecake for doneness by gently shaking the pan. If the cheesecake is done, it will be set except for a small area in the center that will be soft and jiggly. 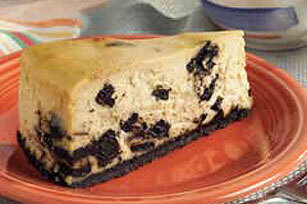 Do not insert a knife into the center as this can cause the cooled cheesecake to crack.